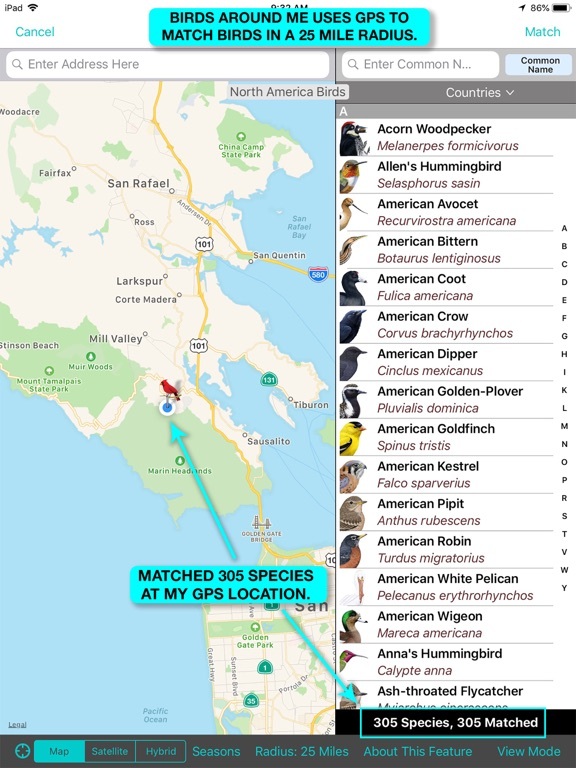 iBird Pro Field Guide to Birds of North America is Apple’s best-selling app for identifying any of the 963 species of birds on the North American continent. 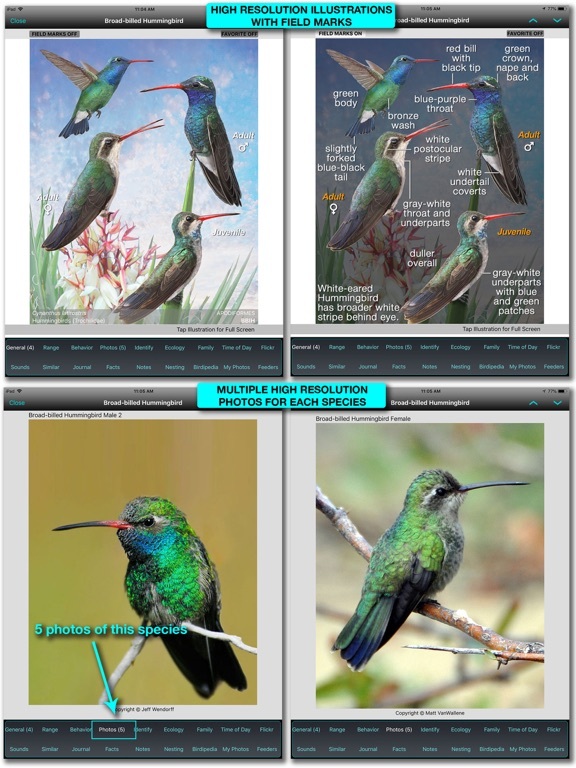 This newest version 12.0 of iBird™ Pro contains our revolutionary Photo Sleuth feature as a low cost in-app purchase. 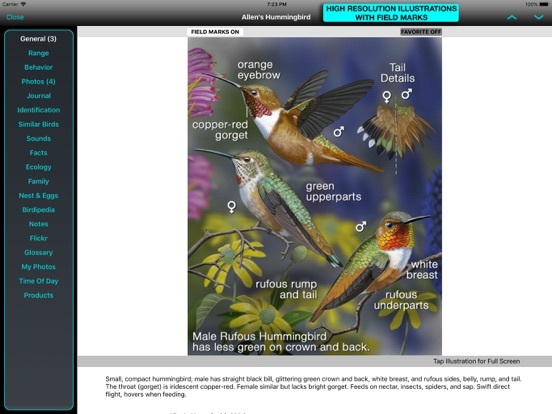 iBird Photo Sleuth will identify the species of any North American bird from a photo, even if of poor quality. No internet connection is needed to use it. 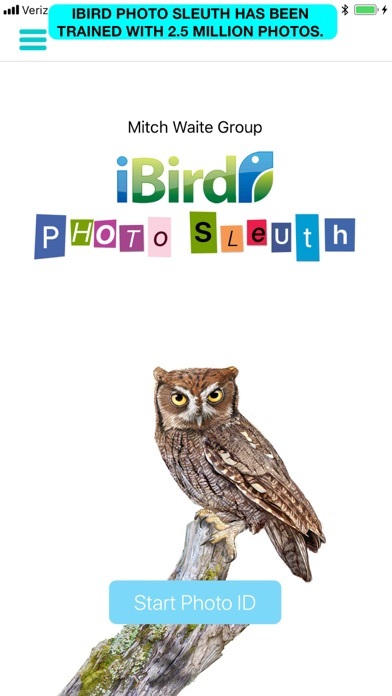 Sleuth is available for a limited time at a 50% introductory price for our iBird Pro customers. A stand-alone version of Photo Sleuth is also available in the app store. You can watch a short slide show of how Sleuth works here: bit.ly/ibirdsleuth. Also new to this iBird Pro version are the 2018 American Ornithological Union updates including new splits, changes to common names, families, orders, etc. We’ve updated 37 high-resolution species illustrations, which, as you know, are one thing that sets iBird apart from all other birding apps, which only offer photographs. 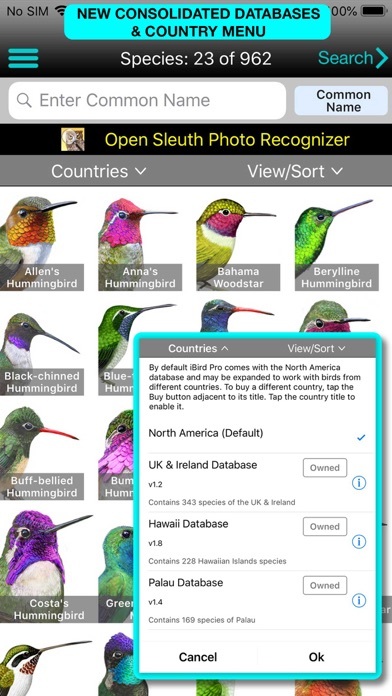 The iBird Pro architecture is now “consolidated”, meaning its default North America database is supplemented with databases of other countries, including the United Kingdom and Ireland, Hawaii and Palau. You can purchase databases for these countries at a price that is much lower than the individual apps, and instantly switch between them inside the app. 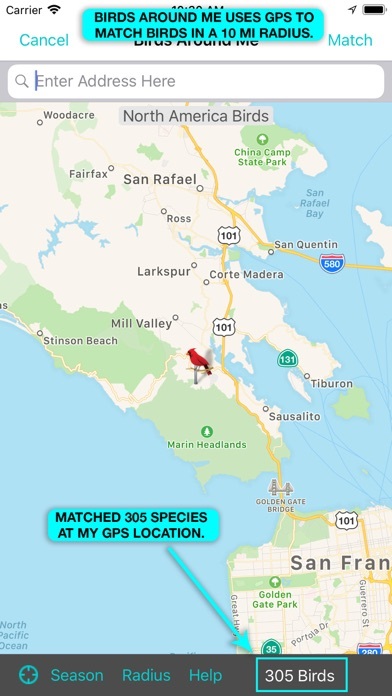 The beauty of this new approach, which Apple asked us to implement, is there is no longer a need for multiple apps; a single version of iBird Pro can now serve as a reference guide to birds around the world. Furthermore, you can install iBird Pro on multiple devices and share it with your family plan so that with one app everyone can enjoy thousands of new species. Of course, we will also continue to update both the features of the app and the content of the databases as we have done for the past 10 years since iBird was first born in the Apple store. iBird continues to offer these other IAP features: Time-of-Day—lets you search for birds by activity levels during day or night (Cathemeral), dawn and dusk (Crepuscular), etc., Birds Around Me (BAM)—shows just those species in your GPS location, Percevia™ smart search—patented feature that helps you identify birds just like the birding experts and Owls of Mexico and Central America—which includes illustrations with field marks, range maps, songs and calls and much more for these remarkable species. iBird developers never sleep: Version 12.0 adds 48 new drawings—to see these go to Search->Illustration Update-11.1. 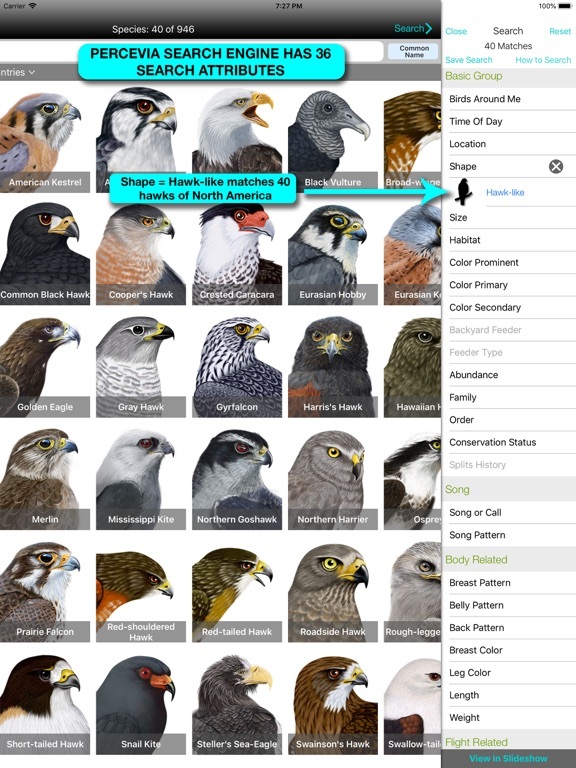 iBird Pro contains 963 species of North American birds, including both common, uncommon and rare species. 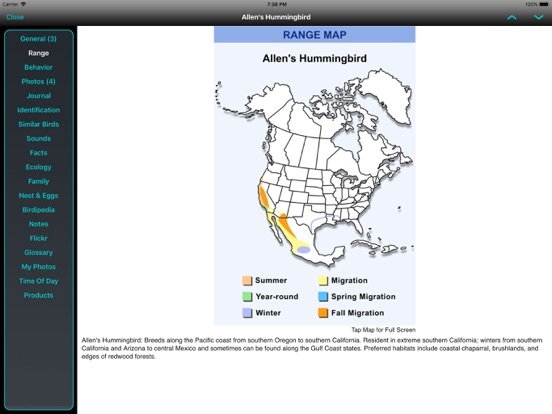 The app is designed to help both experienced and novice birders identify and learn about their birds. 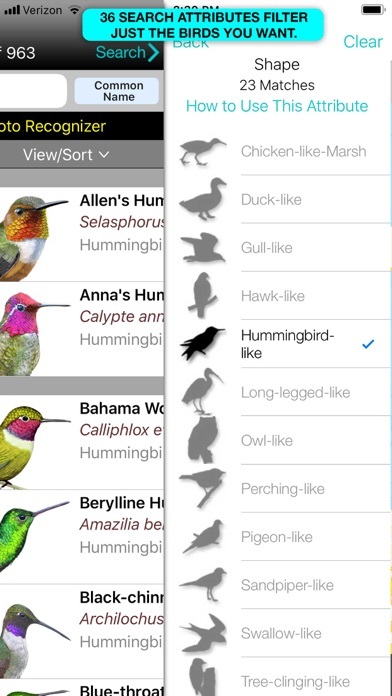 Unlike other iPhone apps, iBird includes popular birds of the Hawaiian Islands and is completely up-to-date with the 2018 AOU and ABA checklists. Databases are available for the countries of the United Kingdom, Hawaii and the famous nation of Palau. ● SHARE the Species page. ● Identify 963 species with in-depth descriptions, including details on appearance, habitat, behavior, conservation, size, weight, color, pattern, shape, sexual differences, etc. ● Share any species page via Mail, Messages, Facebook, etc. ● Birds Around Me and Percevia™ smart search now available as in-app purchases with free 7-day trials. ● Sort birds by first, last and family name and view birds by text, icon, thumbnail or gallery. ● Search by common name, Latin name and even band code. ● Comprehensive range maps that include migratory routes as well as subspecies maps for 40 species. 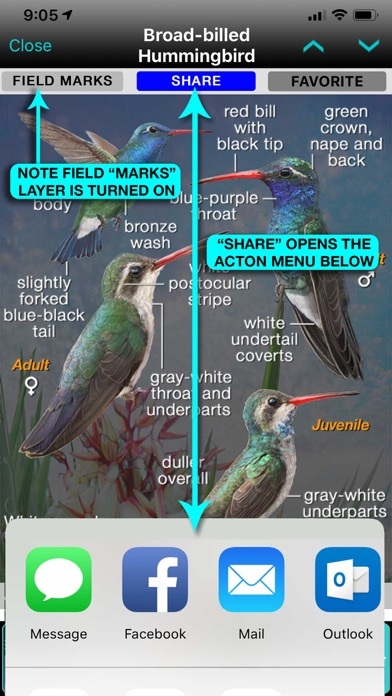 ● Only app with a field mark layer that displays key ID marks for male, female and juvenile birds. ● iBird’s database is completely self-contained; no internet connection is required. 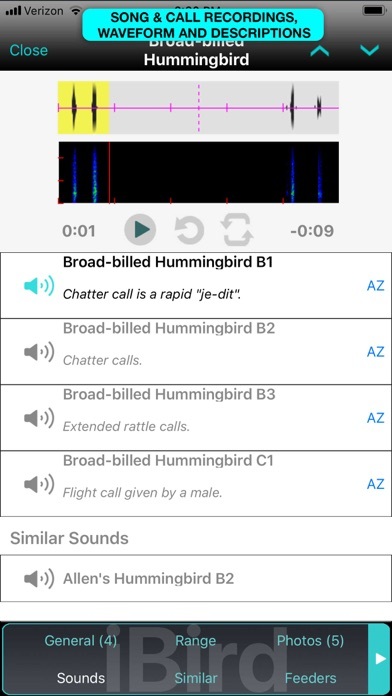 Besides our annual American Ornithological Union update, which includes all the convention changes to North American bird species, this version 12.0 of iBird Pro offers a radical new in-app purchase feature based on artificial intelligence, that we think you’re going to love. It is called iBird Photo Sleuth and allows you identify any species of North American bird from a photograph, regardless of the photo’s quality! Take a quick photo of a bird with the iPhone camera, or access one from your photo roll, and even if it’s a fuzzy little blob in the middle of the frame, Photo Sleuth will tell you in a few seconds exactly what species it is! 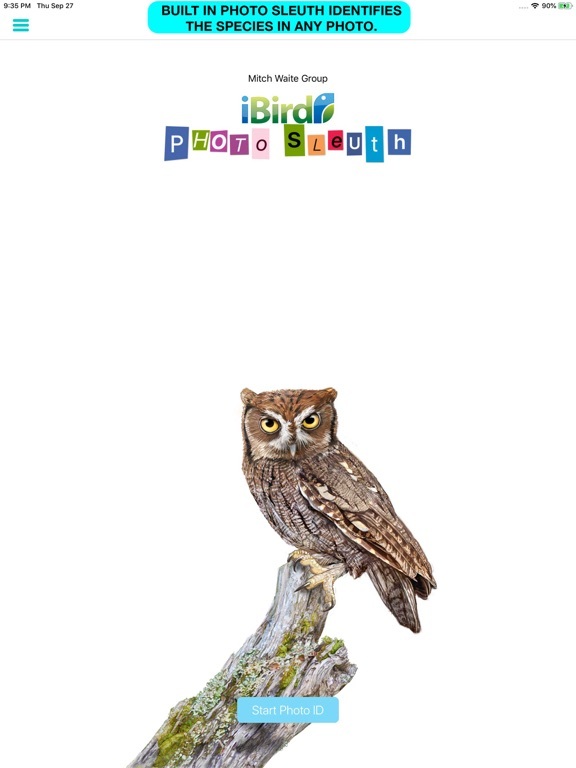 And it’s available at a super low introductory price just for our iBird Pro customers. The other change the new “consolidated” architecture. 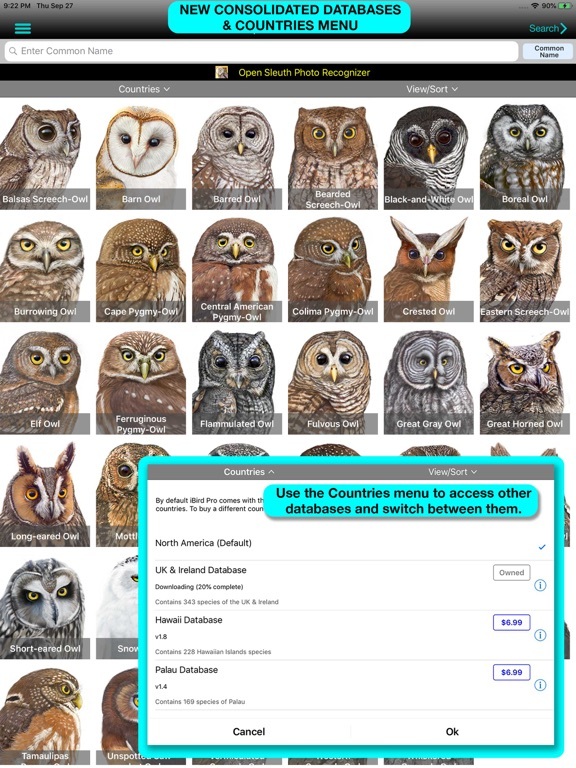 This significant improvement allows you to switch between the different countries the app uses, e.g., from the default birds of North America database to birds of the United Kingdom, Hawaii or even the amazing nation-island of Palau. 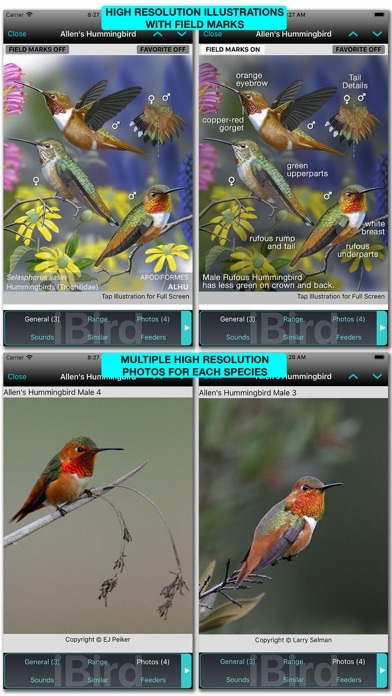 Besides compatibility with the iPhone XS, XS MAX and AR, iBird Pro version 12.0 has been updated for the 2018 AOU (American Ornithological Union Supplement. There are two new species: the Cassia Crossbill and the Sinaloa Wren. The Thayer’s Gull has been lumped in as a subspecies of the Iceland Gull. Plus, there are over 100 small changes, some of which are listed below. We’ve also added a new Splits History search attribute, so you can see what species have been split or lumped in past years. 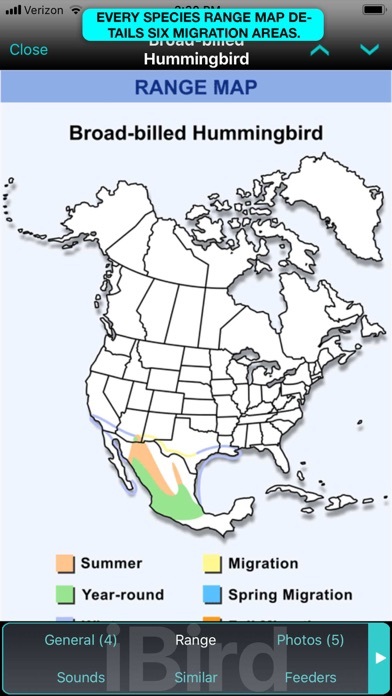 The major AOU change is the split of the White-collared Seedeater into the Cinnamon-rumped Seedeater that is endemic to the Pacific slope and interior of Mexico, as well as southern Baja California Sur. The Morelet’s Seedeater is now the only species of tanager that regularly breeds in the continental United States. We have included updated illustrations for both of these species. The Gray Jay has been renamed Canada Jay. Hill Myna has been removed from the AOU list due to declining populations of this bird in Florida, and it is no longer considered to be established in North America. However, for those customers not familiar with the AOU update, we have left this bird in iBird with an explanation and will remove it next year. There is a new family for the Wilson’s and White-faced Storm-Petrel. They are now in a family called Oceanitidae (southern storm-petrels while the rest of the Storm-Petrels (northern storm-petrels remain in the Hydrobatidae family. In our continuing effort to improve our illustrations and photos, in Version 12.0 we updated 48 species drawings with improved composite illustrations. These are so good you will want to frame them and hang them on your wall. You can see them all together by using Search->Illustration Update->12.0. We’ve also added a new Share feature on the Species page which lets you send the species details to anyone using Mail, Messages, Facebook, etc. 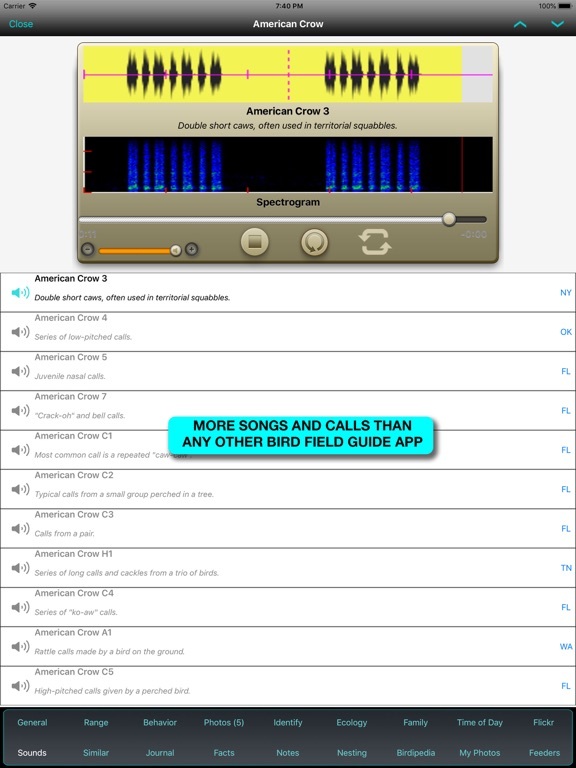 The following new IAP is available to download in iBird Pro 12.0. 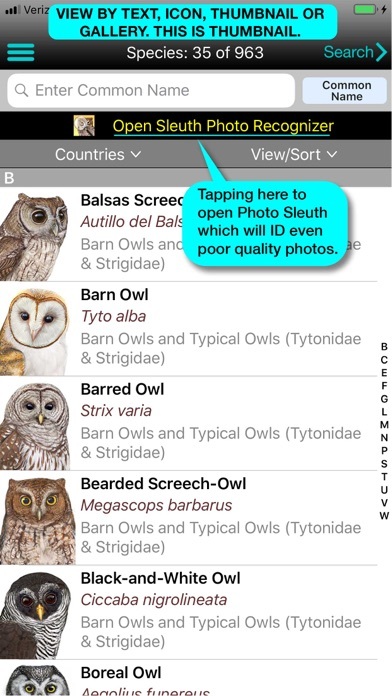 Our newest IAP, Photo Sleuth, turns your iPhone or iPad into a magical bird species identifier. 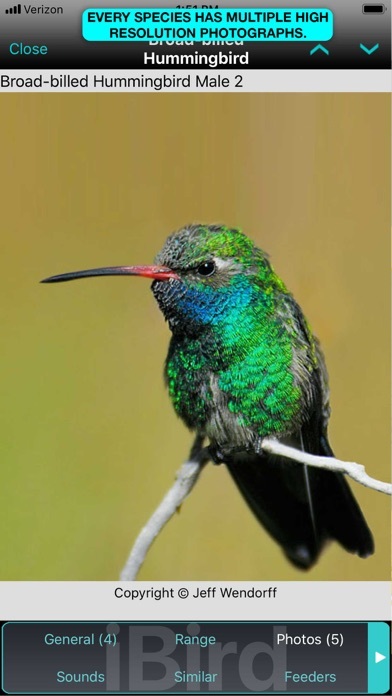 Submit any photo of a bird and, using advanced Machine Learning, it will tell you the exact species name in just a few seconds. 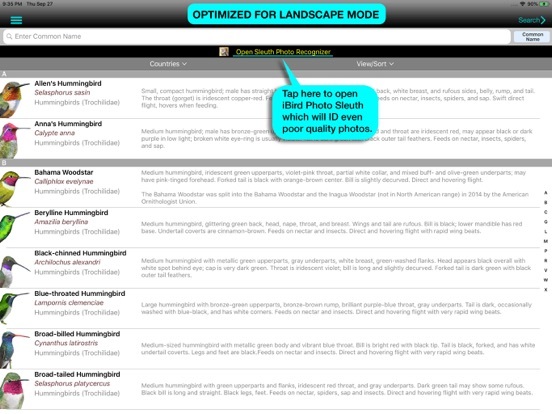 Fixed crash in iPad Gallery Mode and centered Countries menu in landscape mode.